So I tried to go about writing a document to illustrate how I thought SAQs should be answered. I found it difficult to give detailed advice that was more useful than "answer the question" and "be more structured" without sounding pretentious. In the end, I gave up and embraced it, inventing my own model for SAQ analysis and ended up with a wanky sounding manifesto. If you can look past that, I hope that you can understand the points that I am trying to make. I divide SAQs into straightforward, simple Level 1 questions and more complex Level 2 questions (see SAQ Interpretation section below). If you have the raw knowledge, Level 1 questions shouldn't pose any challenge in terms of deciding how to structure them. These are questions that ask you to classify drugs, list potential adverse effects, compare and contrast, etc. These types of questions don't really need any sort of introduction, or maybe just a one line statement if you want. If it's a compare/contrast type question, then the best format to use is often - but not always! - a table. Otherwise, just list out everything under headings. Level 2 questions, by their nature, are more complex and benefit from an introduction that sets the scene and/or broadly answers the question succinctly, followed by the body of your answer that goes over all the nitty gritty details. Eg “Write short notes on the factors that affect the speed of onset of local anaesthetics used to produce peripheral nerve block”. Defining what a local anaesthetic is doesn’t add anything to answering the question. Conversely, if the question was “Outline the pharmacology of local anaesthetics” then providing a definition would be relevant because defining the structure and/or pharmacodynamic action is part of its pharmacology. Don’t define things that are self-evident. Be precise in your language. When you use a term in a way that isn’t technically correct usage , it creates the impression that you don’t understand it. Be specific in your language. When you use a term that is not technically incorrect, but there is a more specific term for what you mean, it creates the impression that you don’t understand it. Writing down correct statements is not enough, the answer must clearly demonstrate your understanding of the topic. How can you more clearly show your understanding of a concept? Q What components make up a car? Q What are the pros of regional anaesthesia in a patient with severe pre-eclampsia? They are both describing the same thing, but who sounds like an RMO and who sounds like a Reg? 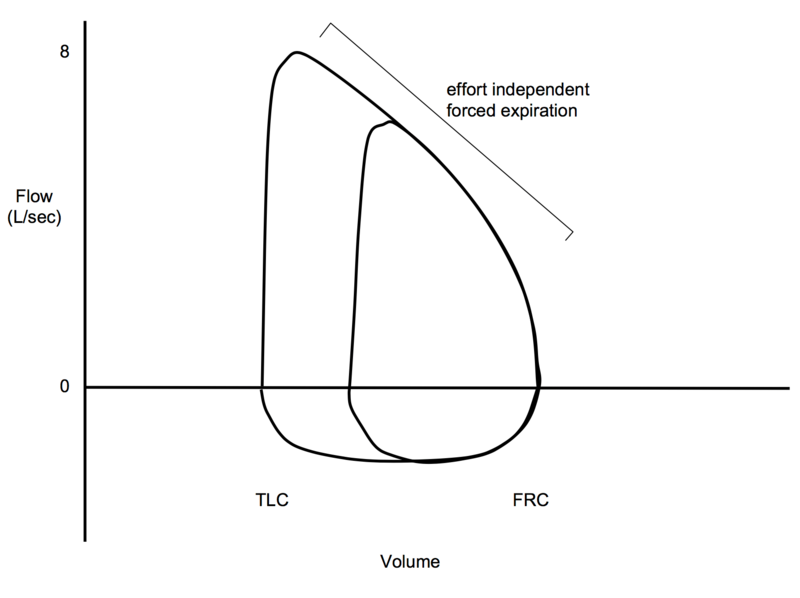 Explain why the flow rate during forced expiration cannot be increased by increased effort. Using keywords helps you to get your point across succinctly and precisely, but using a keyword in isolation is unlikely to gain you marks, use it in a context that clarifies or defines the keyword and demonstrates your understanding of it. Try to highlight distinguishing features to show that you recognize that it is an important point. NB the example above is quite wordy. Unless you are a medal contender, within the time constraints of the exam, you will often not have time to write out everything that you could if there weren’t any time limit. You will need to strip your answer back and decide what are the essential points and what can you omit and still score the bulk of the marks. If you have worked at a certain ICU in Sydney, you know all about the Pyramid of Knowledge ("I up here, you down there"). 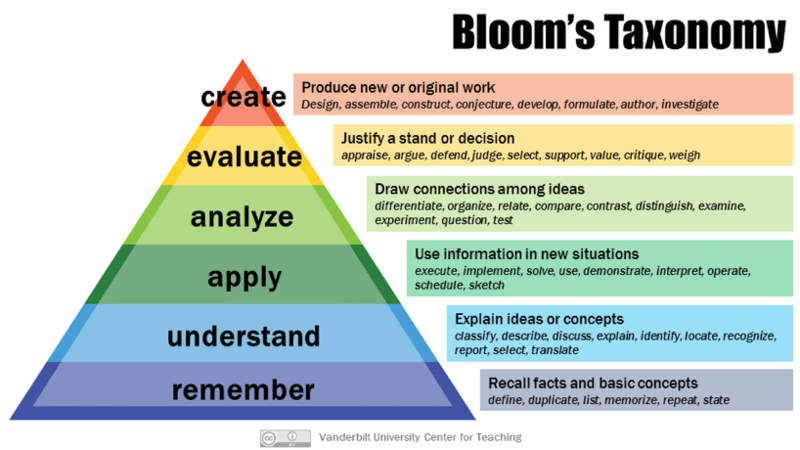 But in all seriousness, Bloom's Taxonomy is a big deal in models of education and adult learning. The examiners refer to it when setting the exam paper. When the examiners set the SAQ paper, they look at it to ensure that there is a good spread of these two types of questions (about 2/3 Level 1 and 1/3 Level 2 questions). This type of question has a clear focus on one topic, which should make up the body of your answer. They generally don’t need an introductory statement, or perhaps only a very succinct one. Basically, you just regurgitate all your knowledge onto the page - in a structured manner, of course. 2006A03 List the non-ideal features of nitrous oxide. 2005A01 Classify anti-emetic drugs. Give examples and describe side effects of each class. 2016A02 Draw and label a circle breathing system. Explain its advantages and disadvantages. This type of question has a focus, that is presented within a broader context. First you need to correctly identify the focus, so that you address it in the body of your answer, but to make it a coherent answer that answers the question, you also need to approach the focus from the standpoint of the context. 2015A10 Outline the physiological changes that may explain why an otherwise well patient may have a reduced urinary output intraoperatively. 2012A15 Describe the role of the kidneys in excretion of acid. 2015A05 Sevoflurane and fentanyl are a common anaesthetic drug combination. Discuss pharmacological reasons why it is useful to use them together. eg 2015A10 Outline the physiological changes that may explain why an otherwise well patient may have a reduced urinary output intraoperatively. Many candidates concentrated on all the possible causes of intra-operative hypotension, rather than describe how glomerular filtration, tubuloglomerular feedback and other mechanisms may lead to oliguria. eg 2015A05 Sevoflurane and fentanyl are a common anaesthetic drug combination. Discuss pharmacological reasons why it is useful to use them together. The most common error made was to provide a table detailing often a considerable number of pharmacokinetic and pharmacodynamic properties and then failing to relate this to the question. This was particularly the case with the pharmacokinetic properties of each drug. Outline the impact of the prevalence of smartphones on society. Smartphones are mobile devices that have functionality beyond making phone calls, similar to a computer. Modern society is very busy and smartphones have facilitated and altered many aspects of daily life. Which answer would you score higher? Most likely Answer A, but why? Both answers were structured. Both answers presented pretty much the same information just from a different perspective, Answer B even has more detail. The information is not incorrect, a lot of the content one would expect in an answer is there, but it somehow just doesn’t feel like a good answer. The reason is because the information wasn’t presented from the perspective of answering the question that was asked. Relate the focus to the context – what particular aspect about the focus does the question want you to highlight? Admittedly, not all questions will fit neatly into this model or structure. Also, I do not advocate rigidly trying to force all your answers to fit into a set “ideal answer” template or to try to follow the same recipe every time. Ultimately, you need to make sure that you read the question carefully – each word in the question has a purpose, don’t ignore them! – and ensure that your answer addresses specifically what the question is asking. The role of the kidneys (in excretion of acid), i.e. how do the kidneys handle acid? Excretion of acid, i.e. how does the body eliminate acid, in general? How does total spinal anaesthesia fit in with the intrathecal injection that was given? Total spinal anaesthesia occurs when nerve electrical transmission is blocked at all levels of the spinal cord, up to and including the brainstem. 20ml 2% Lignocaine is an unusual choice of LA and dose for spinal anaesthesia. It is equipotent to 20ml 0.5% bupivacaine, which is commonly administered intrathecally in the dose range of 2-3ml in clinical practice. Hence it is not unexpected that it would cause total spinal anaesthesia. This would result in various consequences dependant on the type and location of the nerves that are blocked. The Examiners Reports and the plethora of available model SAQ answers that past candidates have written are fantastic resources. However, there are some caveats to using them. Keep in mind that while some of the Examiners Reports are written in the style of the marker's ideal answer structure, many are not - as they were never intended to be used as model answers. Because it is assumed that candidates will look up the relevant information in the recommended textbooks, the marker does not bother to reproduce all that information in the report, and only makes comments about things that were interesting or unusual about candidates' answers. Thus, if you have the mindset that 'the examiner mentioned this, therefore this must be the most important thing to write in my answer', you can end up with a skewed view. Then when you see other people have written model answers that focus on all the things that are mentioned in the Examiners Report, it is reinforced that this is how you should answer the question. Similar questions have been repeated multiple times (2012A16, 2010B10, 2008B14, 2003B09, 2002B11) with pass rates from 28% to 54.1%). This is a core topic within a core topic. It should be a gimme, the pass rate should be close to 100%. What is going on?? Earlier Examiner Reports commented that some candidates structured their answer around Ohm's Law, and some chose the Hagen-Poiseuille Equation - both of which are fine choices to structure an answer around. I think candidates read that and when the question popped up again, used Ohm and Poiseuille again, and so examiners commented on it again. This cycle repeated, and it gave the impression that the core part of the answer was to explain the Poiseuille equation and now candidates spend the first 2/3 of their answer deriving and explaining the Poiseuille Equation. I have had trainees reproduce this model answer from Propofol Dreams in practice papers, almost word for word. I can see that the author has looked at all the past Examiners Reports, and then structured an answer based on all the things that keep getting mentioned. The problem is, the most important point to explain - that blood flow to the LV is predominantly in diastole - is not even mentioned in the answer, and there is not even the classic flow-vs-time graph. I think this is because none of the Examiners Reports mention that, because it is assumed that people already know that from their study, it's such basic knowledge, why would they write about it. A good answer should focus more on the points highlighted in the Brandis chapters "Coronary Blood Flow" and "Myocardial Oxygen Consumption". Instead, candidates appear to be choosing to rote learn a pre-written answer. So keep that in mind when using the Examiners Reports and other people's model answers. NB I'm not dissing Propofol Dreams, it is an excellent resource! 2017B07 Compare and contrast the pharmacology of ephedrine and norepinephrine (noradrenaline). Some candidates answered the question using adrenaline instead of ephedrine and candidates are reminded to read short answer questions carefully. 2013C16 Explain how oxygen supply of organs is maintained during isovolaemic haemodilution. The question specifically stated isovolaemia so that no points were scored for explanations of responses to hypovolaemic shock. Lists of pharmacokinetic values for half life, Keo, volume of distribution, pKa, ionised fractions etc without explaining their relevance did not attract marks. Here is one examiner's comments/examples of when diagrams are useful and when they are irrelevant, from PLOOTD. 2017B03 a) Describe the immediate cardiovascular responses to the sudden loss of 30% of the blood volume in a healthy awake person. b) How are these responses different if the patient is undergoing anaesthesia with sevoflurane? Detailed anatomical descriptions of the sympathetic and parasympathetic nervous systems were not required. Discussions on the effects of intravenous anaesthesia, mechanical ventilation or the treatment of hypotension did not attract marks. 2017B04 a) Describe the generation and features of a normal awake EEG (15 marks). b) Briefly discuss the processing performed by quantitative EEG monitors (such as BIS or Entropy) to produce a single number from the EEG (10 marks). 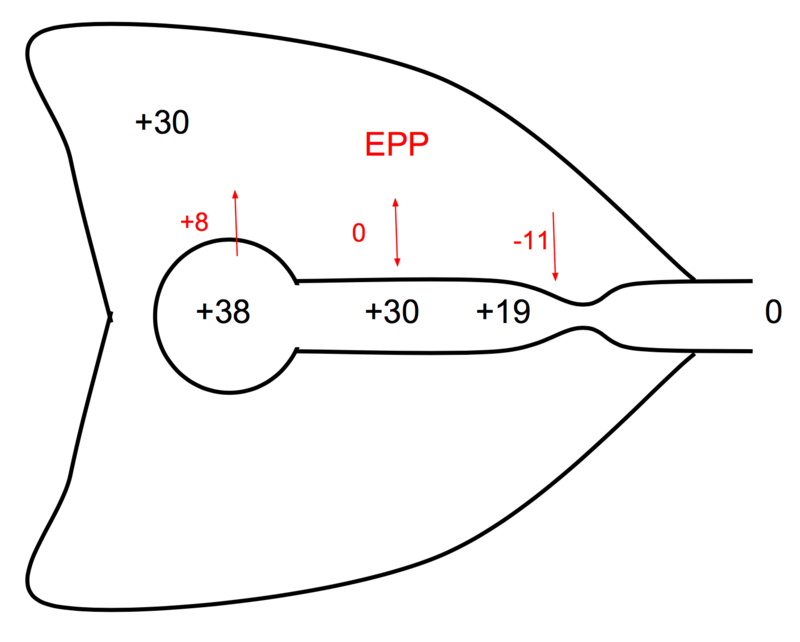 The majority of candidates misinterpreted the second part of the question, and provided answers to highlight the utility of the processed EEG. 2017B06 Describe the effects of morbid obesity on the respiratory system. In addition there were some marks allocated to the pathophysiological changes seen - as obesity is itself a pathology - however a sole focus on pathology was insufficient to achieve a pass. Notably there were no marks achieved for describing the metabolic, endocrine or cardiovascular effects of morbid obesity. 2017B08 Discuss the factors affecting duration of action of a local anaesthetic block to a major peripheral nerve. 2017B10 Describe the physiological processes that influence the rate of gastric emptying. Common mistakes included detailed discussion of gastric acid production or function of the lower oesophageal sphincter, which is not within the scope of this question. 2017B14 Describe the pharmacodynamic properties of propofol EXCLUDING its effects on the central nervous system. Describe how these influence clinical use. Despite the question specifically requesting only information related to the pharmacodynamics, and how these influence clinical use, many candidates wasted time on descriptions of the general pharmacology, including its indications, dosage, mechanism of action and chemical structure. 2017B01 Describe the visceral and somatic pain of labour with particular reference to the anatomy of the pain pathways. Some candidates made inaccurate statements about the utility of epidural or spinal analgesia to treat labour pain. 2017B15 Write brief notes on the pharmacology of tramadol. many clearly made up values for lipid solubility, pKa, protein binding and volume of distribution. Guessing does not get awarded marks. Common mistakes included answering in tabular format, which listed factors that increase or decrease gastric emptying without further discussion. 2017B12 Describe the clinical effects of non-steroidal anti-inflammatory drugs including the mechanism(s) through which they exert these effects. Merely stating the mechanism of the effect as “reduced prostaglandin synthesis” scored minimal points, as the mechanism by which these drugs produce their effects has been well elucidated. Circular statements were another pitfall, where candidates rephrased their point as a way of explanation. 2017B02 Using a labelled diagram, describe how a mechanical (non-cassette) variable bypass vaporiser achieves the concentration set on the dial. Describe the mechanisms that compensate for temperature and downstream pressure changes. At times, it was unclear whether candidates were referring to ambient temperature or vaporiser temperature. 2017B13 Describe the determinants of left ventricular myocardial oxygen supply and demand. Terms such as “tension”, “stress", “afterload", and “pressure" were often used very loosely. Many candidates wasted minutes by writing wordy definitions of all of the terms in the question – including ‘pain’ and ‘labour’ – where many more marks could have been earned addressing the main point of the question. This simply worded question highlighted a widespread pre-occupation with definitions and pre-defined structures falsely regarded as essential for a good mark. Close to the written exam, you must practice at least one full set of 15 practice SAQs, under exam condition. You have to become accustomed to the mental and physical strain of writing for 150 mins. I recommend that you use a low friction gel pen (the aggregation of marginal gains and all that). Basically practicing under harsher than exam conditions. It is imperative that in the real exam you do not go over 10 minutes per question. If your 10 mins is up and you can still write more, move on to the next question! Come back to it at the end of the exam if you have spare time. If you spend an extra 2 mins on a question, maybe you can get an extra 1 mark out of 25. But if that causes you to have only 5 mins left to answer the last question, it's guaranteed to lose you 10 marks. Practice keeping under the time limit! Doing full SAQ answers is both exhausting and time consuming. Much of the benefit of practicing is derived from planning out your answer, practicing coming up with a coherent structure, rather than the actual writing out of the full answer. Give yourself 2 mins to write out a skeleton structure of how you would answer the question. If you already have a good handle on things, then I think doing lots of Show me the Money style practice is the way to go. But what if you find you are struggling with SAQs, it really doesn't come naturally to you? I have tried to come up with some preliminary exercises to target specific aspects of SAQ answering that you may find helpful. (These are all in docx format). This exercise is aimed at forcing you to be step-by-step in your explanation of a mechanism or concept, by explaining things only using words and arrows. This exercise is aimed at reducing tangentiality, by limiting how many points you can use to answer a question, forcing you to decide what is most important. This exercise is aimed at ensuring that you interpret the question correctly and plan out a coherently structured answer.